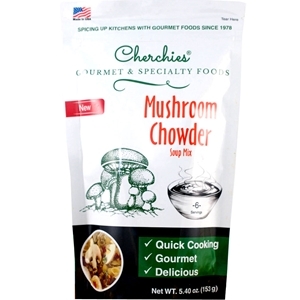 A delicious chowder loaded with mushrooms. It comes with a vegetable blend, pasta, rice and tasty seasonings. So easy and delicious! Makes approximately 6 (1 cup) servings. Add entire contents of the package to 4 1/2 cups boiling water. Reduce heat, cover and simmer for 20 minutes. In a separate saucepan, melt butter over low heat or in a microwave. Stir in flour until blended. Set aside. After 20 minutes, add half & half, sherry and flour/butter mixture to the soup pot. Stir, cover and simmer on low heat (Do Not Boil) an additional 15 minutes to thicken, stirring occasionally. Garnish with fresh parsley (optional). Enriched long grain white rice, enriched macaroni product, freeze dried US grade #1 mushrooms, dehydrated vegetables (onion, red bell pepper, carrot, celery), salt, sugar, hydrolyzed soy protein, garlic, parsley, spices, oleoresin turmeric, spice extractives,(silicon dioxide added to prevent caking). Allergens: Contains wheat and soy.